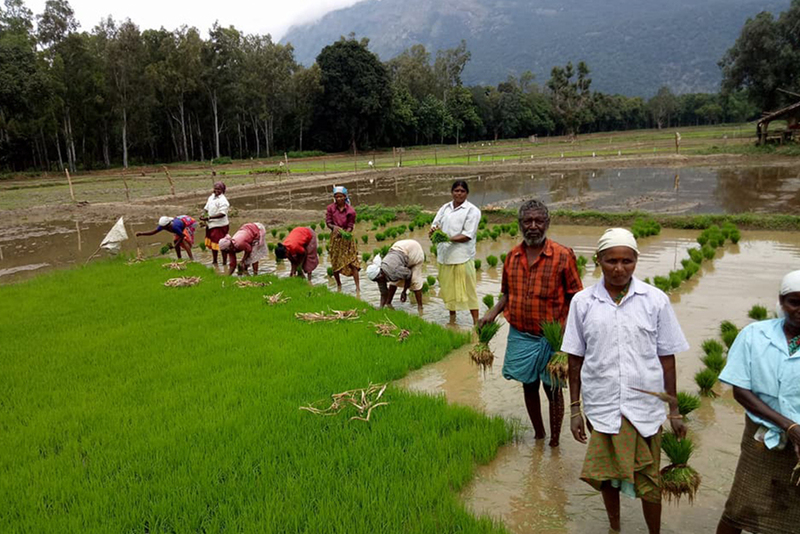 The organic Bhavani rice crop was harvested by the end of January 2018 in Sadivayal village, Coimbatore. This is the second year the 20-member farmers’ club has successfully farmed its 40 acres of land. Use of eco-friendly practices has inspired seven nearby village hamlets to do the same. 3) Revitalized soil after years of pesticide usage. Some challenging circumstances have required patience, persistence, and creative solutions. Amrita SeRVe village coordinator, Sreeni K.R, notes that the rains were 1.5 months late this year. “Then wild boars destroyed some five (5) acres of grown crop,” he says, “which caused the mood of the farmers to sink.” However, a solution was soon found. Night shifts were organized between the farmers, who gave up their sleep to man the hastily built watch house. An ongoing challenge is the fluctuating market price for rice. Storing the surplus crop is a common problem throughout India, explains Sreeni.